It’s just been announced that Feb 18th is the next Kmart Collectors Day. Stay tuned in for more information coming soon. 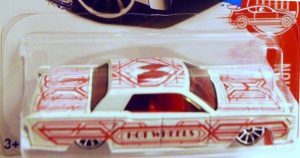 Also announced are the next 3 Red Edition Cars have been spotted and are showing up soon in F cases at Target stores. they are the Rescue Duty, ’64 Lincoln Continental and ‘Tooned  Corvette C6. 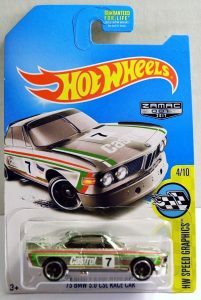 Walmart will continue with the Zamacs in 2017 starting with the E Case followed next in the G cases. Void from last years series was the lack of a Zamac collector’s number on the package, this year it’s back. Note: there is not a mainline collector number on the card. Here is the #1 in the Zamac series HW Speed Graphics ’73 BMW 3.0 CSL Race Car to give you an idea what to look for. If you’re in to variations check out the latest Playsets and Trucking Transporters for 2017. These cars are now produced in China. Some look the same but some have wheel, paint, and other differences. Some minor and some major. 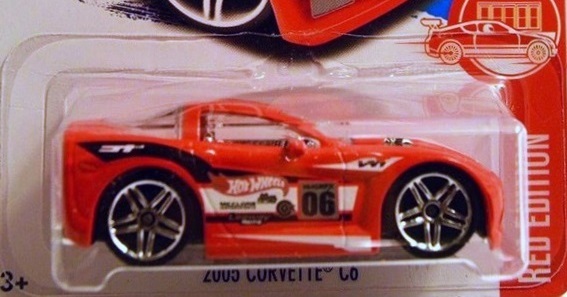 Check out these BLVD Bruisers Top HW Racing – HW Race Team #108 (2013) Malaysia, middle Asst. multi-car Christmas Playset (2016) China, and the last is from the Target Sto N’ Go playset. (2017) China.